A little over a week ago, I headed to one of my favorite self-care spots in Indy. 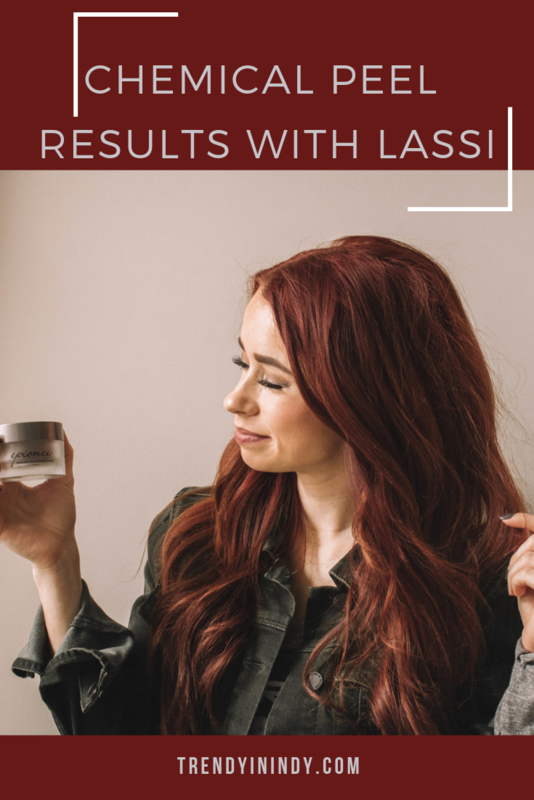 LASSI SKIN worked their magic on my face with a chemical peel this time and today I’m sharing the details with before and after results with you. I’d never had a chemical peel so I was a bit nervous because I wasn’t sure what to expect. Maura prepped my skin by cleansing it twice and then using a prepping solution that gets rid of oil and dirt so the peel can penetrate on a deeper level. That solution smelled strong, but Maura helped with the use of a fan. After that, she applied three layers of the Transform Chemical Peel from Jan Marini containing lactic acid, salicylic acid, resorcinol and then also applied a retinal activator. As she added the layers of the peel, I could feel my face tingle kind of like when you get a Charlie Horse. The burning sensation was subdued with the use of a handheld fan. After my layers had been applied and I could tolerate how my face felt without air on it, I headed on my way to meetings throughout the day. I couldn’t wash my face for four hours. Over the next few hours, my skin continued to increase in redness which Maura told me was typical of this facial. I cleansed my face and applied the enriched firming mask from Epionce. LASSI SKIN is so good about providing after care products for treatments that are a bit more aggressive. Within about 48 hours the skin on my face started to peel. The only annoying part about that was the fact that I had meetings throughout the day and I felt like my makeup was constantly coming off. The peeling started on a Thursday and was fully done by Monday, leaving my skin feeling silky and refreshed. You can see the redness, especially on my cheekbones. Almost 48 hours after on Thursday morning. After I started peeling on Thursday morning. This is more dramatic than it looks because I left my makeup on so you could really see the peeling. Five days after chemical peel. Peeling is almost over. Six full days after treatment and makeup goes on like butter. Chemical peels are great for all skin types and are a results driven facial. If you’re looking for a pamper session where you get your face rubbed for an hour, this is not the facial for you. Try the hydrafacial at LASSI SKIN. However, if you want to even out your skin tone or help reduce the appearance of sunspots, this is a results-driven facial just for you. Overall, I really enjoyed the chemical peel and the results I’ve seen from this facial. It was a more aggressive treatment and my skin doesn’t require those frequently. Every once in a while is great though! For those of you that want to try services at LASSI SKIN, follow them here on social media to get a discount on your first facial! *This chemical peel post is sponsored by LASSI SKIN. All thoughts and opinions are my own.